One in three adults in the United States suffers from hypertension, also known as high blood pressure, However, since the condition has no noticeable symptoms, a lot of people have high blood pressure for several years before they are diagnosed. If left untreated, hypertension can lead to many significant health problems, including stroke, heart attack and heart damage. problems, including heart attack and stroke. The hypertension diagnosis clinic at UF Health Nephrology – Shands Hospital utilizes the most sophisticated technology to ensure accurate diagnosis and suggest optimal treatment options for high blood pressure. For more information, please call 352.265.4845. 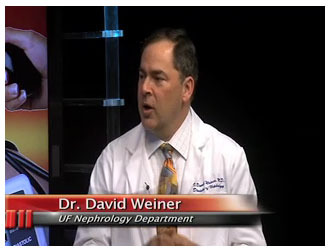 UF Division of Nephrology faculty member, Dr. David Weiner, sat down with with WCJB-TV20’s Bob Williams to discuss high blood pressure treatments for the January 24, 2013 edition of Your Health Reports. 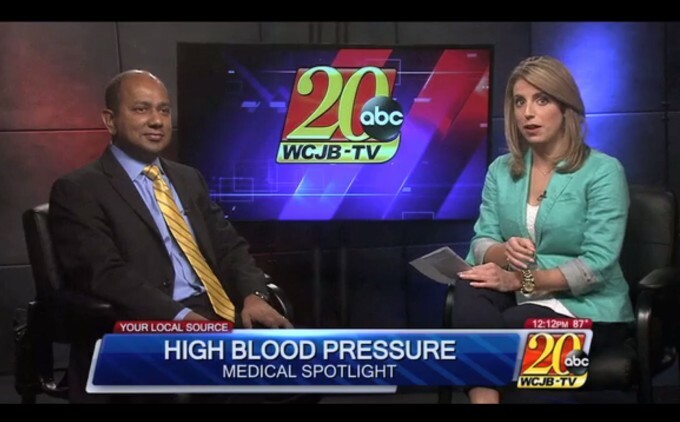 UF Division of Nephrology faculty member Dr. Rajesh Mohandas was interviewed on Hypertension for the June 15, 2015 Media Spotlight.